I'm moving on in the chart system to show you what I did with my son once I noticed that we needed to update the Coin Chart System to something else! Once your child reaches Kindergarten you really need to be teaching them about REAL money. They should be able to earn it and manage it! If you don't start now they will have trouble knowing what to do when they are older! First thing I did was thought of a few areas which my son needs to work on, or areas he has trouble with. These can ALWAYS be changed on the chart as the child grows up and changes. I made up four columns of areas I want him to work on and ALWAYS have an OTHER column (things always pop up that wont fit into a certain category)! These columns are where all of his GOOD marks go! You can also use the columns to put their daily chores in... but I wanted as many chances as I can to PRAISE my child so all of his chores fall under helping out or cleaning up! Then, you have what I call Oops Marks! This is anything your child does that isn't ok, behaviors you don't want them to repeat! Here is where the coins system stays the same.... If your child gets 6 Oops marks in one day, they lose a special privilege. For my son, he would lose ALL TV and video games for the rest of the day! Now, here is where the money comes in! For every mark on the good side, my son earns 10 cents. For every Oops mark he pays us 10 cents! I LOVE that is is only 10 cents because you can search for good things your child does ALL day long and constantly point them out with a good mark! This is the big change that we made from the "Coin System" because as you child gets older, situations become more complicated! It's good to have a system that is open ended! Also, I think it changes us as parents because we are searching for the GOOD in our children and not just focusing on the bad all the time! It seriously changes the mood of the whole family! *Tip: Change the amount of money the child gets for each mark by their age! If you are doing this with your 6 year old and your 9 year old, your 9 year old should be making more per mark! Anytime I ask my son to help me out by getting me something I need and bringing it to me, and he does it....without complaining, I will say "Brenden, that was such a big help to mommy, you get a helping out mark!" or on a shorter note, "Thank you Brenden, that's a mark!" If it is something he just does by himself without me asking him and it helps me out A LOT I might say, "Brenden, that was such a big help to me, I am giving you 2 or 3 marks for that!" If his sister hits him on the head and he looks at her and says "I don't like it Kiki, that really hurts!" I would reply to him, "Brenden, thank you for using your words and not hitting your sister back! That is a mark !" Then I would deal with sister! Something that may fit in the "Other" column might be, if my son told the truth about something when he could have lied! Or, if I thought something he did was sweet... example, My daughter was crying for daddy when he left for work and my son went up to her and said, "Kiki, brother is here, you can play with me! Come on, here is a toy!" and he got her to stop crying....This could also fall under the "Helping Out" column.... But all that really matters is you give them marks for good behavior! REMEMBER, the stuff you REALLY want them to repeat, give them MORE than one mark! It really helps to show them what behaviors you value! The Oops marks are pretty self explanatory... If your child makes a bad choice you can say, "Oh, that's too bad you chose to do that! That is an Oops mark!" If it's REALLY bad, give them more than one Oops mark.... just as above this will show them the behaviors that you really feel shouldn't be repeated. Don't forget to remind them, when they are getting close to 6 Oops marks in one day, of the special privilege they will lose! It's pretty bad if they get 12 Oops marks in one day (my son has done it twice when we first started the chart) but if it ever gets to that point you can take away another privilege! The example below is of the chart I created in Adobe Illustrator, for a span of 4 weeks! You can just print a bunch of these out and have them ready to put up once the four weeks are over! You won't believe how fast it goes by! At the bottom I made up a place to total up the marks! You total up the good marks then subtract the Oops marks and get the amount of marks you will be paying you child for! For example, if my son made 48 good marks and 7 Oops marks...that would equal 41 marks I will pay him for which is 4 dollars and 10 cents! It's simple and straight forward! On the topic of money, in the real world you get compensated for the work you do at your job. In MOST cases, if you don't work, you don't get paid! So at the end for the week, we say "It's time for your Compensation....not your Allowance." Also, if you can put into practice some way that your child saves some of the money they earn, that would be GREAT practice for the future! Remember you are raising and ADULT and you want them to learn good habits to take with them in the future! 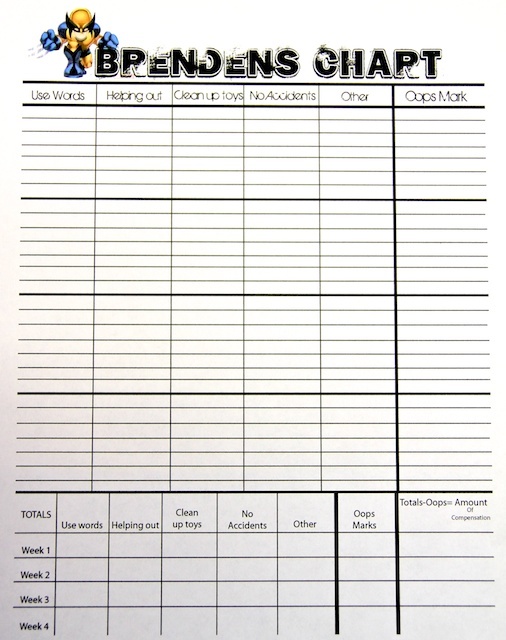 *For this chart to work, no matter how busy it gets, try to pay your child WEEKLY! Also have them be the one to calculate, with your help, how much they earned and how much they have to pay you! 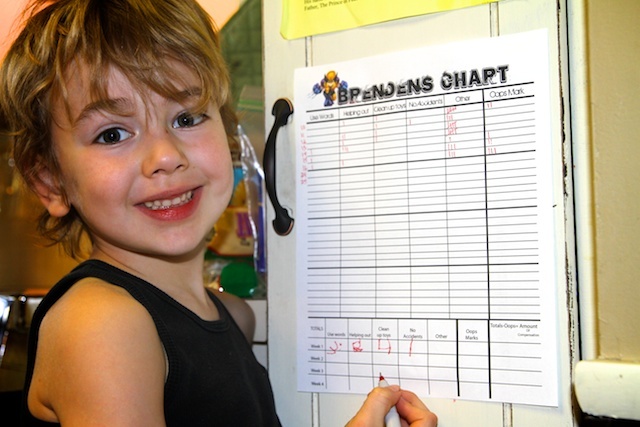 *Although, this chart posted isn't decorated much.... like the Coin System, try to decorate the chart or have your child decorate it to make it more "FUN"! *My system is only a suggestion, and things are different in every family! I hope you take the basic ideas and use them to apply them to your family and children! Your children, even if they are all close in age might all have different charts! This is a good thing! Take the differences in your children and make up a system JUST FOR THEM!!!! That is the way you will get the most progress and positive behaviors out of them! ALWAYS REMEMBER, when you start a new system, your child might seem that they are getting worse before they are getting better, ALL children will test the system to see if it's gunna work like you say it will! I hope these ideas help you get on track with your child! PLEASE leave me any questions you may have in the comments section! I would LOVE to help! Awesome, I really like it. Honestly though, right now I think my 6 year old would be in the red almost every day. So, I think the coins will work well for right now, and eventually we'll change to something similar to this. I love how it teaches a bit more about calculating the money :) Nice work, and thanks for posting it!!! Thank you so much for the lengthy and very helpful explanation for both the older kid chart and the younger one. I am super excited to implement this in my family...here's for hoping it works!! I have tried to access this chart so I can print it but it looks like I need to be a SCRIBD member. Is there any way to make it a printable off of your blog? I have to have a host for my PDF files. I don't really know how to do this any other way. I will try to let you know! I made one in a word doc. If I knew how to post it I would post it here. Can I do that? Are you able to email us the PDF file? Also just wondering what the categories 'Use Words' & 'No Accidents' would be used for. Im assuming no accidents maybe has to do with potty training?? I would like to try these charts with my kids who are age 5 & 9! Sarah, I would love to email the file but I don't have time to do it right now because I am packing me and my kids for a trip. When I have down time, maybe after my trip, I can. The "No Accidents" for my son is just because he has trouble stopping what he is doing to go #2. We have had lots of trouble with him having accidents because he ttys to hold his potty so long. He works well with the positive marks he gets for getting to the potty on time and listening to what his body is saying. The "use words" is one of my FAVORITE columns!!!! This is the one we are working on most with our 7 and 4 year olds. Instead of writing the negative thing they are doing on the chart I try to write what I want from them.... For example, I really don't want them to hit and scream at each other. They need to talk out what they feel instead of getting physical so I am always saying "use your words". This also works when your child is throwing a tantrum because they are screaming instead of calming their body down and talking to you about it.